No.2, Wen-hua West Road, Weihai, Shandong. Postcard: 264209, China. 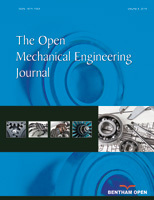 In this work, the dynamic responses and vibration characteristics of mechanical system with revolute clearance joints are investigated numerically. Considering clearance in joint, the intra-joint contact model that is generated at clearance joints is established using a nonlinear continuous contact force model and the friction effect is considered by using a modified Coulomb friction model. A well-known slider-crank mechanism with a revolute clearance joint is utilized to perform the investigation. The effects of clearance on dynamics of mechanical system are analyzed by timedomain responses and frequency domain analysis. The investigation results show that the dynamic responses of mechanical system with clearance are obviously vibration and the amplitude increases from the mechanism without clearance. The results also indicate that the behavior of mechanism with clearance is nonlinear.